This can be prepared 1-2 days in advance. Put the water, sugar and peppercorns in a small saucepan. Set over a high heat and stir occasionally until the sugar has dissolved. Remove from the heat and leave to cool. Meanwhile, put the lemon juice, vodka and salt into a shallow plastic box. Cover and chill. Once the peppercorn syrup is cold, strain into the lemon juice mixture and season to taste with freshly ground pepper. Place in the freezer. 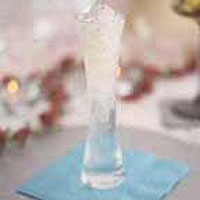 After 2 hours, remove and mix any ice crystals into the liquid with a fork. Return to the freezer and repeat the process every hour until the slushy mixture has formed a mass of crystalline ice flakes. Serve in shot glasses.